Emory University's Chemical Biology Discovery Center has been selected as a Specialized Center in the Chemical Biology Consortium, a national network of scientists on the leading edge of drug discovery and development, centered at the Frederick National Laboratory for Cancer Research. The consortium is the discovery engine for the National Cancer Institute Experimental Therapeutics (NExT) Program aimed at accelerating the discovery and development of new and innovative cancer drugs through multidisciplinary research teams spanning academia, industry and government. The teams will guide promising molecules through a discovery pipeline from academic laboratories into clinical trials for the benefit of cancer patients. The Frederick National Lab, sponsored by the National Cancer Institute, is managing the expansion of the consortium to 22 sites around the country with world-class expertise in high-throughput screening, structural biology, medicinal chemistry, cancer cell biology and other relevant expertise. Emory’s center is participating in the consortium via a research subcontract from Leidos Biomedical Research, Inc., prime contractor for the Frederick National Lab. Emory will provide specialized expertise and services including fundamental cancer biology insights, structural biology, medicinal chemistry, and high throughput screening assay development to the consortium over a five-year period. The NExT consortium will focus on unmet medical needs such as molecular targets previously considered "undruggable" and malignancies that are underrepresented with effective pharmaceuticals. Emory has been a member of the NExT consortium since it was originally created in 2009 and has so far received more than $6.5 million in funding for drug discovery projects. "We are excited to continue our work in the Chemical Biology Consortium. The multidisciplinary team-oriented approach has been highly productive, generating promising lead compounds that are advancing to clinical trials as new anticancer drugs for patients," says Haian Fu, PhD, principal investigator of Emory's Chemical Biology Consortium contract. This consortium utilizes an innovative operational model that allows the NCI to work hand-in-hand with specialized academic centers in chemical biology and molecular oncology and with industry to maximize the resources and expertise available for cancer drug discovery. 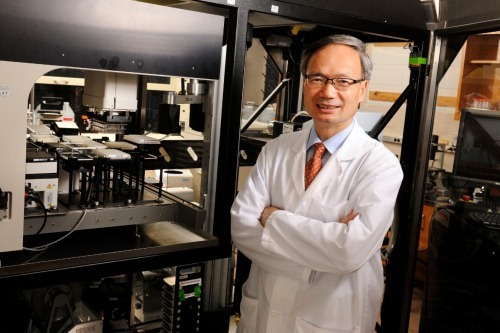 At Emory, Fu is director of the Emory Chemical Biology Discovery Center, the leader of Winship Cancer Institute's Discovery and Developmental Therapeutics Program, Winship Partner in Research Endowed Chair, and professor of pharmacology in Emory University School of Medicine. "Through the expertise and leading-edge equipment available in Emory's own Chemical Biology Discovery Center and through our partnership with the hundreds of top scientists in the NExT consortium, the Winship Cancer Institute is on the frontlines of cancer drug discovery that will benefit our current patients as well as generations to come," says Walter Curran, MD, Winship's executive director and co-principal investigator of the Emory Specialized CBC Center. "Winship provides a strong foundation in cancer biology and molecular oncology and the critical matching funds that enable the sustained operation of the center." The Georgia Research Alliance and Emory School of Medicine provide critical infrastructure support for the Emory Chemical Biology Discovery Center. Scientific leaders in the Emory Specialized CBC Center include Xiaodong Cheng, PhD, Yuhong Du, PhD, Dennis Liotta, PhD, Huw Davies, PhD, and Margaret Johns, PhD, with the support of a team of cancer biology experts including Jing Chen, PhD, Paula Vertino, PhD, and Keqiang Ye, PhD.